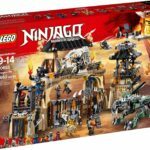 Join the ninja heroes in a battle against Iron Baron and the Dragon Hunters at the LEGO® NINJAGO® Dragon Pit, with 3 detachable sections for easy play. Team up with ninja warriors Teen Wu, Jay and Zane to confront the LEGO® NINJAGO® Dieselnaut tank, featuring rotating turrets with spring-loaded shooters, an opening minifigure cockpit, minifigure platform with fully opening roof, crane function, jail and hidden weapon rack. Repel the Dragon Hunters’ HunterCopter attacks on Firstbourne with ninja warriors Cole and Kai and claim the Dragon Armor. The highly posable LEGO® NINJAGO® Firstbourne dragon features a removable minifigure saddle, plus flapping wings and swiping tail functions. 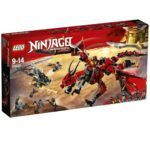 Zoom skyward with the LEGO® NINJAGO® Zane – Dragon Master flyer, featuring a buildable LEGO brick handle, minifigure capsule, blade element, dragon wings and rip cord. 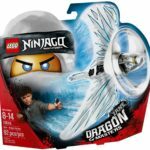 Create magic in midair with the LEGO® NINJAGO® Kai – Dragon Master flyer, featuring a buildable LEGO brick handle, minifigure capsule, blade element, dragon wings and rip cord. 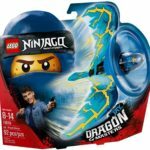 Launch into aerial action with the LEGO® NINJAGO® Jay – Dragon Master flyer, featuring a buildable LEGO brick handle, minifigure capsule, blade element, dragon wings and rip cord. 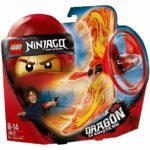 Be ninja with the awesome LEGO NINJAGO Cole – Dragon Master flyer! Begin your training by building the LEGO brick handle. 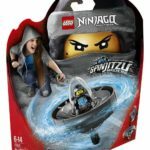 Spin to the max with the LEGO® NINJAGO® Cole – Spinjitzu Master spinner toy, featuring a Spinjitzu spinner with buildable LEGO brick handle, spinner element with minifigure capsule, and a rip cord. 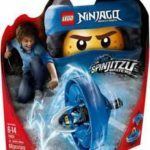 Test your Spinjitzu skills to the max with the LEGO® NINJAGO® Jay – Spinjitzu Master spinner toy, featuring a Spinjitzu spinner with buildable LEGO brick handle, spinner element with minifigure capsule, and a rip cord. 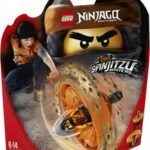 Be ninja and learn new Spinjitzu tricks with the LEGO® NINJAGO Nya – Spinjitzu Master spinner toy, featuring a Spinjitzu spinner with buildable.